Mornings are tough, ok! At least they are for most of us, who were not blessed to be born what some may call a ‘morning person’. I am most definitely not one of those. And things are even harder in winter when the cold, dark outside makes you want to do anything but embark on a commute to work. I 100% feel ya. Not because I’m a lazy bum who wishes they didn’t have to work, but because there are far more entertaining and pleasant things to do. And so, here are seven things I’d rather do in the morning instead of going to work. You know, like on a Saturday morning, minus the hangover. I want to wake up because I’ve had enough sleep, not because my alarm went off. I want to stay in my warm bed for as long as I wish, instead of rolling out half asleep, realizing my room is freezing but being too blind in the dark to find my dressing gown quick enough. Yummy toast with Nutella and fruit, or a smoothie, a giant cup of tea and a duvet. These make my perfect morning, but sadly, they don’t have duvets, comfy beds or a smoothie maker in the office. I mean, what kind of a place is this office?! I’ve always loved a good stretch, and since my friend Melinda hooked me on yoga, I’ve enjoyed it so so much. Now that I have started going to the gym (I know, who even am I?! ), I need that stretch more than ever. Who knew your muscles get so stiff from workin out?! So rather than going to the office in the morning, I’d prefer to gently roll out of bed and onto my mat, putting on a nice yoga video on and have a chilled practice. The best thing about practising at home is that the beautiful, strong girl who likes to show off her handstand while I can barely hold a plank IS NOT HERE! I mean, living in my dressing gown is a dream. It usually means it’s the weekend, so if I get to hang out in it on a Wednesday, I’m a happy kid. You may have noticed the bathrobe I’m wearing on these pictures is extremely cute. 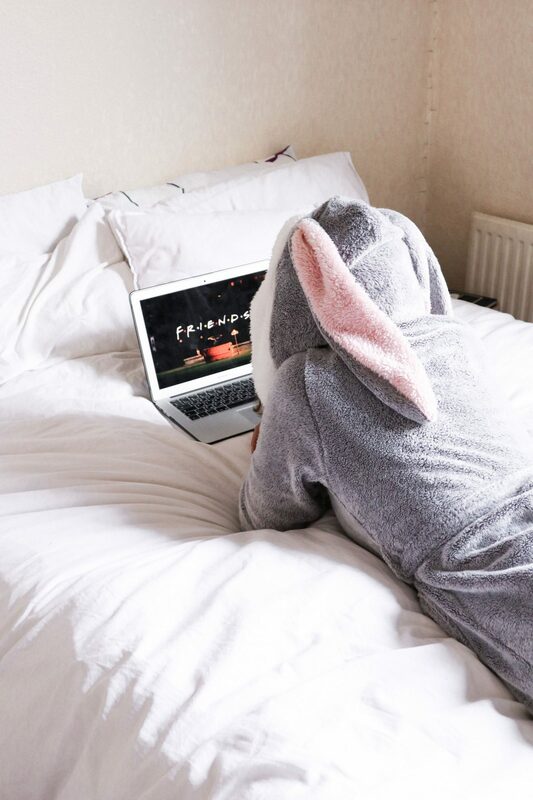 That’s why I am obsessed with it – it’s the softest thing ever, it’s super cosy and gets bonus points for the adorable bunny ears. It was a gift from Hunkemoller* and yes, you do need one in your life too. Trust me on this one. Ok, I usually read a book on my commute, but it’s not as pleasant. Instead, I’d like to put a mask on and settle in on my bed with a book. Educating myself on The New Fashion Rules or learning important things about skincare is really something best done in bed with a cup of tea. So in this scenario, my friends are also not at work and we can spend our mornings having a catch up over a cup of (insert hot beverage of choice) in a cute cafe while munching on cinnamon buns. Who’s up for it? Tell me, what are the things you’d rather do in the mornings, instead of going to work? Or maybe you’re one of those lucky people who love their job so much, they’d rather be at the office than at home? This post contains PR samples. 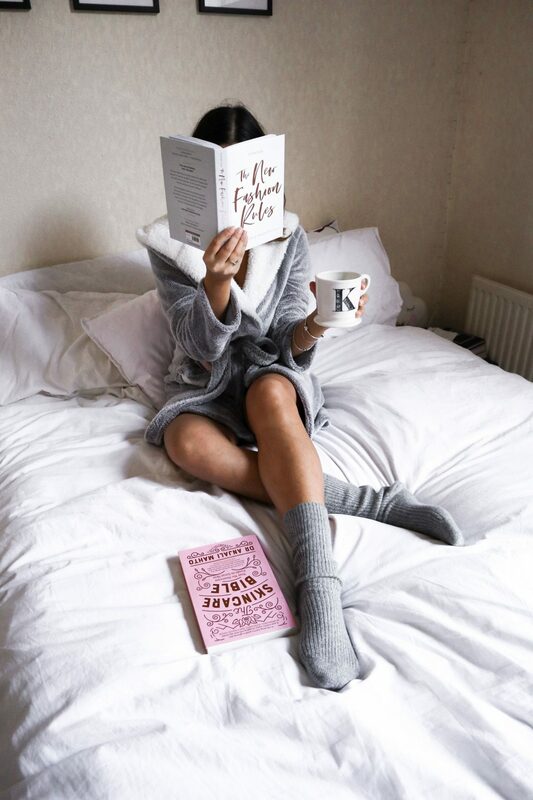 The bunny bathrobe featured in this post has been kindly sent to me by Hunkemoller, and the cashmere socks by Soak & Sleep. All images and views are my own. I love the robe, how damn cute! Great post! In goodness! You totally read my mind with this post today. I feel so sleepy and uninspired by the weather, I only want to go back home and catch up with my book and a cup of tea. 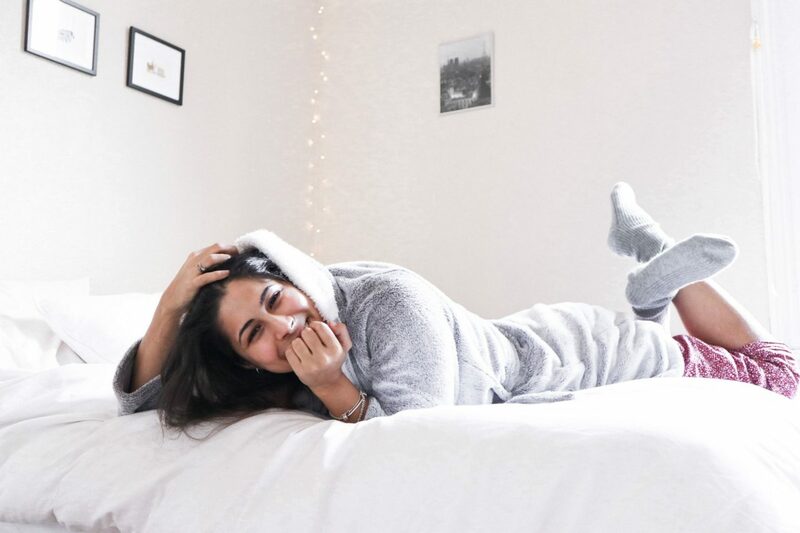 I’d definitely rather stay in bed, chilling and reading – not one for eating in bed as the crumbs annoy me – I love yoga too, it changed my life 15 years ago 🙂 glad to hear you’re enjoying it.